As part of Wizards of the Coasts product revamp, with the release of 3rd Edition Dungeons and Dragons and the Forgotten Realms campaign 3rd edition, a new product line of minatures was released in 2001 called "Chainmail", a D&D related game with its own rules set and various boxed minatures. Whilst WotC announced the end of the Chainmail brand in the summer of 2002, this Forgotten Realms boxed was still released. 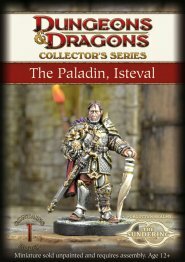 Designed as a companion to the City of the Spider Queen roleplaying adventure, this boxed set features key characters from the City of the Spider Queen adventure, which ties into the R.A. Salvatore's War of the Spider Queen novel series. Both the drow as a race and the location referenced in the title are extremely popular, and this set will allow fans to immerse themselves in the world of the drow. Format: Single 25mm resin miniature in blister pack. This miniature is for The Sundering Collector's series and was a free model given by Gale Force 9, for pre-orders of Ghosts of Dragonspear Castle at GenCon 2013 and Spiel in Essen. 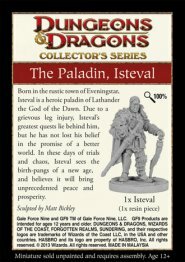 'Born in the rustic town of Eveningstar, Isteval is a heroic paladin of Lathander, the god of dawn. Due to a grievous leg injury, Isteval's greatest quests lie behind him, but he has not lost his belief in the promise of a better world. In these days of trials and chaos, Isteval sees the birth-pangs of a new age, and believes it will bring unprecedented peace and prosperity. 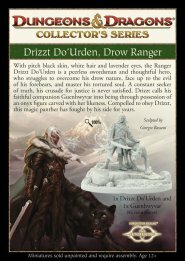 'With pitch black skin, white hair and lavender eyes, the Ranger Drizzt Do’Urden is a peerless swordsman and thoughtful hero, who struggles to overcome his drow nature, face up to the evil of his forbears, and master his tortured soul. A constant seeker of truth, his crusade for justice is never satisfied. Drizzt calls his faithful companion Guenhwyvar into being through the possession of an onyx figure carved with her likeness. 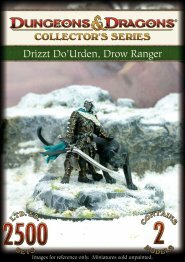 Compelled to obey Drizzt, this magic panther has fought by his side for years..